This unique dagger is fitted to an oval barrette to allow you to stylishly carry a knife at the back or side of your head! 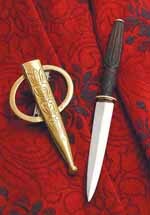 The barrette and scabbard are gold plated as are the exposed parts of the dagger. The grip is hardwood, carved much like a Scottish Dirk on this pretty little piece. Made by Windlass Steelcrafts®. Overall-71/2" • Blade-4" long, 5/8" wide, 3/16" thick • Wt.-4 oz.